Who's gonna clean up that mess? 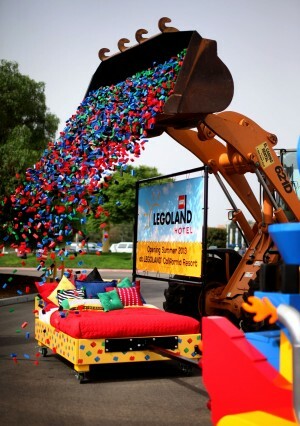 More than 28,000 thousand multi-colored DUPLO® bricks were poured out of a big front loader in celebration of the LEGOLAND Hotel announcement. LEGOLAND California announced yesterday that plans for a three-story LEGOLAND Hotel are underway. 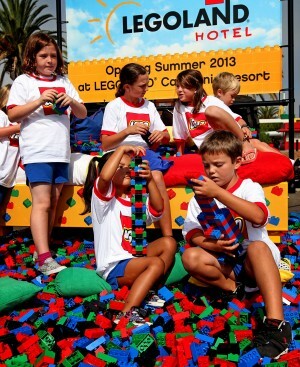 Slated to open Summer 2013 on the site of the current LEGOLAND California Resort in Carlsbad, the LEGOLAND Hotel will be the first of its kind in North America. Children invited from the Boys and Girls Clubs of Carlsbad wore pajamas to the press conference to get in the “hotel mood” and squealed with delight as the bricks came pouring down on to the bed. Like LEGOLAND California and the SEA LIFE Carlsbad Aquarium, the hotel will be designed for families with young children and will feature rooms and suites themed after the most popular LEGOLAND areas. The 250-room LEGO-themed hotel will feature brightly colored LEGO décor, a pool, and restaurant. This entry was posted in Attractions, Family Vacations, Hotels & Places to Stay, Insider Tips and tagged attraction, Carlsbad, county, diego, hotel, legoland, north, places, san, stay, to by Courtney. Bookmark the permalink. We want to share our experience at Lego land on 3/9/11. Our bag pack containging cellphones 2 wallets (IDs, cash, Cards) was stolen from the stroller why we were at water ride. It happened between 6.30 and 7.00. Our lovely day was spoiled by this incidence. We informed the guest service as soon as we found out that the bag was missing. Legoland Guest Service was very IRRESPONISBLE. No immediate action taken in place and asking us to fill the form. They said they will call us if somebody return it.We told them we are from MA and had to fly back tomorrow (4/9) and our IDs were inside. As they didn’t do anything, we had to call 911 on our own and report the police for the incidence. Themepark charged alot of money and can’t even provide or assists to the guests. We have been calling to the Legoland Guest Service for the followup and left the messges.NO one return our calls. I want to say Legoland is very irresponsible. Please contact me if you need more to know. I am very sorry to hear about your experience at LEGOLand. We have forwarded your information to Jolene Sanchez, Guest Experience Liaison at LEGOLand, and she will be contacting you soon. If you get a chance, please leave a reply to this comment once your issue has been resolved. Thanks for visiting San Diego and we hope to see you again!